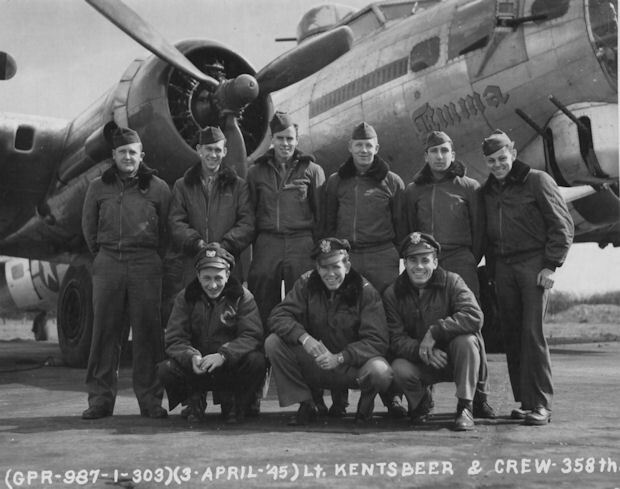 2Lt William K. Kentsbeer (P) - Flew on two missions as CoPilot with crew orientation Pilots. Other missions as Crew Pilot. 2Lt Glen A. Tableman (CP) - Did not fly on two missions (356 & 358) with Lt Kentsbeer. Flew on two missions (357 & 358) as CoPilot with other Pilots and four missions (359, 360, 363, 364) with the Lt Kentsbeer crew. Sgt Elmer E. Wright (WG) - The Lt Kentsbeer flew all of their missions without a Waist Gunner. Cpl Wright flew on two missions (356 & 358) as Tail Gunner with the Lt Kentsbeer crew.